During the winter storms of 2013/4 Chesil Beach at Portland Harbour, Weymouth lost approximately 300,000m3 of shingle. This caused extensive damage to the reno mattresses, gabion castle and undermining of the concrete wave wall. 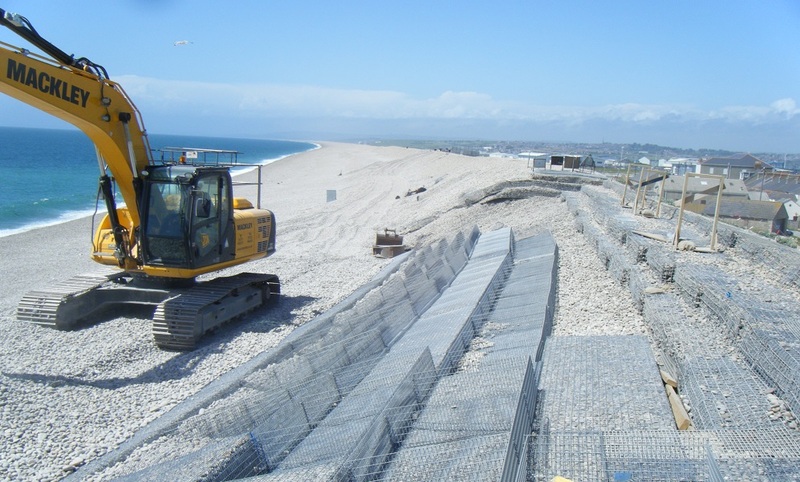 While the Environment Agency and Army reprofiled the beach to maintain the defences, Mackley mobilised plant and equipment to repair the void under the concrete wave wall. Access was very difficult as the rock armour and steel sheet piles had to be transported over a 9m shingle bank. A repair was designed using rock armour to form an access road over the clay. Sheet piles were driven in front of the wave wall and the void under the wall was filled with concrete. This rebuild and strengthening work offers further protection and stability to the wall. These works were followed by repairs to the existing gabion baskets at the gabion castle and crest protection mattresses and other damaged areas that had also been identified for repair. Chesil Beach is part of the Devon and Dorset Jurassic Coast World Heritage Site, and all works undertaken have been sensitive to this environment. For example, gabion baskets have been filled with the existing shingle to better blend in when completed, a process which also complies with Natural England’s wishes.